Though appreciating a great deal of Wright’s argumentation in Resurrection and the Son of God, I did interact critically with him in my dissertation regarding his views on resurrection in the Old Tetament. Wright is willing to accept this position as “broadly accurate,” though he will adjust it to fit his unique emphasis on the exile of Israel (RSG, 86, 121-24). In contrast, I would argue that the early parts of the Old Testament affirm the resurrection. For instance, Job claims that in the future, when his Redeemer stands on the earth (which will occur after the decomposition of his body), he will see God himself in his flesh (Job 19:25-27). Wright says on this passage, “The passage in Job often thought to be an exception to this rule [that in Job there is no concept of life after death] is almost certainly not.” In Wright’s view, Job 19:25-27 is full of translational difficulties. Since other, clearer, passages in Job deny life after death, Wright finds it unlikely that this difficult passage should be understood differently (RSG 97-98). But these other passages are not as clear as Wright supposes. Job 7:7-10 does say that once a man dies he never returns to “his house” or “his place.” But this is a true statement even for those who believe in resurrection. Resurrection occurs at the end of the age, and people do not return in this age to their own houses and places (Thomas Aquinas, The Literal Exposition of Job , trans. Anthony Damico [Atlanta: Scholars, 1989], 148-50). Likewise Job 14:1-2, 7-14 applies only to this present world. A time limit is placed on the period in which people will not rise: “Till the heavens are no more he will not awake or be roused out of his sleep” (14:12). But after God’s wrath is past, Job desires to be remembered (14:13). Wright also prejudices his readers by cutting off the quotation in verse 14 with the question and providing “no” as the answer, whereas Job continues in verse 14 with a hope of his “renewal.” Even if the question of 14:14a should be answered, “no,” the remainder of the verse reveals that the “no” is not a denial of the resurrection (Aquinas, 228; Andersen, Job, TOTC, 169-70, 172-73; Talbert, Beyond Suffering, 111, 317-18, n. 66-67). Thus Wright’s first example does not prove the absence of resurrection, and his second example actually points toward belief in resurrection. The way is therefore cleared for a look at Job 19:25-27 itself. Wright says that nobody can really know whether the key word in 19:26 should be translated “in my flesh” or “without my flesh” (RSG, 98). But Job insists that his very own eyes will see his Redeemer (19:27), and eyes presuppose a body (Talbert, 121, 324, n. 51, 52, 57; Andersen, 193-94). Though not every phrase of Job 19:25-27 is entirely clear, the translation that affirms bodily resurrection is, on balance, the most likely. I would also argue that the promises of God to Abraham also imply a resurrection. God had told Abraham, “I will give to you and to your offspring after you the land of your sojournings, all the land of Canaan, for an everlasting possession” (Genesis 17:8). But Abraham never received this promise during his lifetime (Heb. 11:13). It is this truth that lies behind Jesus’s affirmation that Exodus 3:6 teaches the resurrection (Matt. 22:23-33 || Mark 12:18-27 || Luke 20:27-40). God is the God of Abraham, Isaac, and Jacob because he has covenanted with them, and in the Exodus he is fulfilling some of the covenant promises made to them (Ex. 2:24-25). He is not the God of the dead but of the living, because the patriarchs must be raised one day for the promises to them to be fulfilled. Wright correctly concludes that this passage is not only about the patriarchs in the intermediate state but that it also deals with their future bodily resurrection (RSG, 423-36). Given what Hebrews 11 says about what Abraham beleived, concerning these promises, I think we must conclude that Abraham beleived in resurrection. Several Davidic Psalms also imply resurrection: 11:7; 16:8-11; 17:15; 23:6; 139:18. And yet a number of Psalms speak in a way that would seem to deny resurrection (Psalm 6:5; 30:9; 88:3-7, 10-12; 115:17; cf. 2 Samuel 14:14). Their presence together in the Psalter, along with the ascription of Davidic authorship to passages in both categories, argues that passages that seem to deny life after death should be harmonized with passages that affirm the afterlife and resurrection. Hosea 13:14 is a borderline passage. In affirmation of ressurrection, see the NIV and HCSB. For an alternative approach, see NASB and ESV. On this passage Wright attempts to divorce later inspired interpretation of this passage from the original author’s intention (RSG, 118-19). I don’t find this an acceptable approach. Isaiah clearly promises, “Your dead shall live; their bodies shall rise. You who dwell in the dust, awake and sing for joy! For your dew is a dew of light, and the earth will give birth to the dead” (Isa. 26:19).Isaiah’s affirmation of resurrection here is doubted by few, though Wright seems to indicate that many (not including him) wish to date the passage late simply because it affirms bodily resurrection (RSG, 116). Daniel 12:2-3 is almost universally acknowledged to teach bodily resurrection (RSG, 110). Given this evidence from the Old Testament, I would argue that bodily resurrectionis affirmed throughout the entire Old Testament, from patriarchs (or earlier) to prophets. This material is adapted from my dissertation, available here for purchase as a paperback or for free download as a PDF. Gentry, Peter J. and Stephen J. Wellum. Kingdom through Covenant: A Biblical-Theological Understanding of the Covenants. Crossway: 2012. In this volume Wellum and Gentry embark on the ambitious project of laying out a third way between covenant theology and dispensationalism. They label their position New Covenant Theology or Progressive Covenantalism (others who hold a similar position are Tom Wells, Fred Zaspel, John Reisinger, Thomas Schreiner, and Jason Meyer). [Update 4/21/16: The authors wish to distinguish PC from NCT. The two share some similarities, but they do not wish them to be equated. Since Schreiner and Meyer both contribute to the new book on Progressive Covenantalism, it seems safe to identify them with PC] Wellum and Gentry’s contribution is the arguement that covenant forms the “backbone” of Scripture’s storyline and that understanding how the covenants relate is key to right biblical and systematic theology. Of course many dispensationalists and covenant theologians could affirm these two points. The differences lie in how the covenants are seen to function and fit together. Before outlining their view Wellum first outlines the positions of dispensationalism and covenant theology. Too often non-dispensationalist surveys of dispensationalists are incomplete and thus unfair. The worst surveys will take the Scofield Reference Bible as their main source without recognizing the development that his taken place since Scofield’s time or the variety of opinion within dispensational thought. Wellum does not fall into this error. His survey is one of the best surveys of dispensationalism by a non-dispensationalists that I’ve read (Vern Poythress’s work, Understanding Dispensationalists, would be the other good survey). Interestingly, the survey of covenant theology was not quite as well done. Wellum did pick up on divergences between some covenant theologians about how the Mosaic Covenant relates to the covenant of works. However, he did not deal with the views of earlier Baptist covenant theologians. This is a significant oversight since at one point Wellum suggests the labeling his own position “Baptist theology” (25, n. 7) [Update 4/21/16: The author noted that this footnote was a bit of joke] and since he repeatedly argues that one of the major differences between progressive covenantalism and covenant theology is paedobaptism versus credobaptism. I was also less than impressed with the parallels Wellum tried to draw between dispensationalism and covenant theology. He contends at the end of chapter 2 that covenant theologians adhere to a genealogical principle rooted in the Abrahamic covenant which leads them to assume that the infants of believers are part of the church. He then concludes, “Ironically, this is a similar hermeneutical argument that dispensational theology makes, yet in different areas. Dispensational thought makes it in regard to the land promise while covenant theology makes it in regard to the genealogical principle, both of which are tied to the Abrahamic covenant!” (76). [Update 4/21/16: I should add that the similarity argued here for between CT and DT is that neither allow circumcsion/land to be viewed as typological; it is argued that if circumcision/land is traced throughthe biblical covenants it becomes clear that they must be typological.] Though the claim of this parallel is repeatedly made, I’m not convinced the parallel exists. Covenant theology makes its case for infant baptism by plugging the Abrahamic covenant into an overarching covenant of grace, thereby failing to recognize the covenant shift that the new covenant brings about. Dispensational theology, on the other hand, is simply asserting that the promises of the Abrahamic covenant will be fulfilled as they were given. The new covenant does not abrogate these promises; indeed, it actually repeats them. The divergences between progressive covenantalism and dispensationalism actually lies in hermeneutics, to which Wellum turns in chapter 3. In chapter 3 Wellum lays out the hermeneutical principles that underlie the system that he and Gentry are proposing. Many of these are to be heartily endorsed. Wellum begins by defending self-attesting canon and its claims to inerrancy, concluding from this that the diversity of Scripture does not undermine “an overall unity and coherence between the testaments.” Amen. Second, Wellum affirms that we discern God’s intent in Scripture through the human authors of Scripture. He affirms that this leads to a canonical reading of Scripture that is open to a certain kind of sensus plenior. He rejects an approach to sensus plenior that asserts the “fuller sense” “cannot be discovered by grammatical-historical exegesis,” noting that that this leads to “a subjective reading of the text without hermeneutical controls.” Instead, he argues, “We discover God’s intent through the human authors of Scripture at the canonical level. God says more than the individual authors may have known, yet he does not contravene what the authors wrote and intended” (85, n. 11). I would assent to this, though I’m going to argue that Wellum and Gentry do not consistently adhere to this principle. Third, Wellum says that Scripture is the inspired interpretation of God’s redemptive acts, meaning that the pattern “preparatory word, then the divine act, followed by the interpretive word” (88) is typical in Scripture revelation. The corollary to this is that revelation is progressive, which, in turn, means that theologians need to note where texts fall in redemptive history as they systematize. These three principles lead Wellum to conclude that interpreters deal with three horizons: the (1) text in an (2) epochal context (cf. Rom. 5:12-21; Acts 7:1-53) and a (3) canonical context. Again, I would register no disagreement with Wellum here. However, the discussion of canonical context balloons into a discussion of typology, and here some differences emerge. I also question the claim that types always escalate. It seems that included in this statement is the assumption that escalation involves displacement. Thus Wellum concludes that the specific promise of a land to the nation of Israel is displaced because the land of Israel is a type with the antitype being the new creation. I would certainly agree that with sometimes escalation involves displacement. The sacrificial system was typological of Christ’s sacrifice on the cross, and the antitype displaced the type. But what of the Davidic kingship? Is that typical? If so, the escalation from type to antitype did not displace the Davidic kingship, for the Messiah reigns as the Davidic king. Perhaps it would be better to say that earlier Davidic kings were typical of the climatic Davidic King. The earlier kings are displaced, in a sense, but the David kingship is not. So what of the land? One could say that the land is typical of the new creation, but is not the land part of the renovated earth? If so, it is hard to see how the antitype can displace the type (expansion, yes; elevation, yes; displacement no). Perhaps it would be better to speak of the land as conquered by Joshua or as reigned by Solomon as typical of the new creation. Again, just as historical kings are displaced by the final king, so the land in a historical period is displaced by the climatic historical period, but this is different from claiming that the promises regarding the land are displaced. This discussion points to an odd formulation in this book. Wellum speaks of the land promise being typical. To claim that a promise is a type is an interesting claim, and one that is not defended. It also leads to complications. It puts Wellum in the odd position of saying the promise is a type for something other than what was promised such that the promise itself will never be fulfilled. What is more, this would seem to contravene the earlier affirmation that the fuller sense of Scripture “does not contravene what the authors wrote and intended,” though God may say “more than the individual authors may have known.” I would take that statement to mean that God can mean more than he promised to Abraham, but he can’t mean other. In other words, I have no argument with seeing the “Eden . . . presented as the archetype, which the ‘land’ later looks back to and forward to in anticipation of the recovery of the new creation” (124). To say the land promise expands to encompass the new creation is something that I think is at least hinted at in its original statements in Genesis. What I fail to see is how this expansion or escalation cancels out part of the promise. Part two of Kingdom through Covenant is written by Peter Gentry. It is supposed to provide the exegetical basis for the theological conclusions. Gentry rarely, if ever, makes clear the connection between his exegesis and the broader project of the book. Gentry also seems given to rabbit trails. At points it seems that Gentry had a collection of exegetical studies that he wanted to share, and since some connection between those studies and the thesis of the book could be made, this was his opportunity to share them. Thus, as a reading strategy, I would recommend reading parts one and three first. Come back to part two in order to see how some of the claims in these other parts are sustained (or not) exegetically. None of this is to deny that this section presents a great deal of helpful exegesis. Nonetheless, I do think that this section suffers from two methodological problems. First, Gentry’s method places too much weight on ANE background material (a point also noted by Brack and Oliphiint in their review of Kingdom through Covenant). In terms of methodology, I would argue that background material should play a similar role as the that given by the magisterial Reformers to tradition. The Reformers highly valued tradition but it served interpretation of Scripture rather than determined it. I would like to see interpreters value tradition, the history of interpretation (something that often seems lacking in those who emphasize ANE or Second Temple background), and background materials while keeping both servants of the text rather than masters. Second, as almost every other reviewer has noted, the exegetical section suffers from lack of interaction with the New Testament. A New Testament exegetical section is vital for the argument of this book. For Wellum and Gentry’s view of typology to be accepted, they need to demonstrate that the New Testament operates with their view. Without this argumentation, their approach to typology is asserted, not demonstrated. Though Gentry is not a New Testament scholar his section could without doubt have been tightened up to make room for the contribution of a New Testament scholar such as Thomas Schreiner. I hope this will happen if there is a second edition. Two substantive issues should also be raised. First, while I agree with the argument for a creation covenant, and while I think the creation covenant and the Noahic covenant are related, I remain unconvinced that the Noahic covenant is simply a confirmation of the creation covenant. As I look at these covenants, the parties are different, the promises are different, the prohibitions are different, the sanctions are different, and the nature of the covenants are different. Though I think Gentry made the case that karat berit typically means to initiate a covenant and heqim berit typically means to confirm a covenant, it does seem to me that there are occasional exceptions (Gen. 6:18; Ex. 6:4; Eze.16:59-62). However, despite the great stress that Gentry placed on this point, I don’t see it as essential to their case. More significant, however, is their rejection of distinctions between unconditional and conditional covenants (or between royal grant and suzerainty covenants). They argue that all the covenants demand obedience of the partners. I agree that all of the covenants have expectations placed on those within the covenant. The Noahic covenant, for instance, has expectations that God places on all mankind. But human violations of those expectations, even on a large scale, will never result in a second global flood. That would violate the nature of the covenant. On the other hand, Israel was told that their violation of the conditions of the Mosaic covenant would result in certain penalties. I think Gentry and Wellum have over-compensated on this point. In part three Wellum deals with the biblical and systematic theological implications of their proposed system. Chapter sixteen focuses on biblical theology. As one might expect from a book titled Kingdom through Covenant, kingdom and covenant are the two foci of this chapter. I agree with Wellum and Gentry that “kingdom through covenant” captures a central biblical motif, but I was disappointed with how these motifs were fleshed out. Wellum states his understanding of the kingdom of God in five points. (1) As Creator God providentially rules over all creation. (2) After the Fall a distinction is made between God’s providential reign over all things and “his saving reign in the context of a rebellious creation to make all things right” (593). (3) The kingdom could have come through the covenants if those in the covenants lived according to them; their failure means that the kingdom will come through covenant promises. (4) The Davidic Messiah is the one who will inaugurate the new covenant, which will fulfill all of the other covenants. (5) In the New Testament, “the ‘kingdom of God’ refers primarily to God’s kingly and sovereign rule,’ especially as it relates to salvation. It does not primarily refer to a “geographical location” (595-96). This understanding leads to the following conclusions. Because of the way in which Christ fulfilled the Old Testament, “many of the themes that were basic to the Old Testament have now been transposed and transformed” (598). Thus the kingdom of God is no longer rule over a people in a land but is the rule of God in the transformation of a people. Wellum’s error comes at the starting point of his definition of the kingdom of God. If one starts with the assumption that the kingdom is God’s sovereign rule over creation, then one is left with the difficult question of how the kingdom comes with the Messiah. God has always been sovereign over the creation; the advent of the Messiah does not alter that reality. Wellum addresses this problem by introducing the idea of a saving reign alongside the sovereign reign of God. But in doing biblical theology, the theologian should endeavor to see how Scripture itself develops a motif and examine that categories that Scripture uses. The Bible itself begins its treatment of the kingdom theme in Genesis 1:26-28. The kingdom announced there is the rule of man over creation under God’s sovereign reign. Thus the kingdom of God announced in the Gospels does not refer to the sovereign, providential reign of God over all things, as that has never been altered. Rather, it refers to the reign of God as mediated though man, his vice-regent. That reign was damaged by the Fall, but it is restored in the Messiah, who reigns as the last Adam. It is this kingdom, rather than God’s providential reign, that is preserved and promised by the covenants. The covenants preserve the realm of this kingdom (Noahic), promise the coming Seed who will reign (Abrahamic, Davidic), and provide for a people who is to model what a reign under God in a land is to look like (Abrahamic, Mosaic). All of these covenants climax in the inauguration of the New Covenant by the Messiah. On this understanding, the kingdom as inaugurated by the Messiah does have an emphasis on salvation and transformation, as Wellum rightly notes. The Messiah’s goal is to reverse the Fall by creating a people who will rule the earth under God’s greater rule (Dan. 7:27; Rev. 22:5), and for this people to fulfill that goal they must be saved and transformed. Those who are not will be judged by the king when he returns and fully establishes his reign on earth. But this conception of the kingdom does not allow the “a theocratic state in which God rules by his human vassal in the Davidic dynasty” and “the immediate transforming reign of God” to be pitted against each other. Such a dichotomy fails to reckon with the reality that one of the reasons for the incarnation was for the Messiah to fulfill Genesis 1:26-28 by reigning as a man. Further, it wrongly dismisses the importance of the realm: a kingdom centered on Jerusalem that encompasses the entire creation (Ps. 72:8). The marvelous thing about God’s plan is that Jesus reigns as both human and as Yahweh. Part of the glory of God’s plan is the way these two reigns combine in Christ. Therefore, it diminishes the glory that God intended to minimize one aspect of the reign of Christ and to highlight only one aspect. Wellum then turns to covenants after his treatment of kingdom. He argues that instead of speaking of a unitary “covenant of grace” or of dispensations, one should give attention to the development of God’s plan in the multiple biblical covenants. I’d agree with this. But there are problems in some the ways this idea is developed. Wellum says that the “new covenant supersedes all the previous covenants in redemptive-history” (604). From this he concludes that circumcision ceases and that the land promise is changed. But what does it mean to say that the New Covenant supersedes all of the previous covenants? Does it mean that the Noahic covenant is no longer still in effect? I would find that hard to square with Genesis 8:21-22. The New Covenant is specifically contrasted with the Mosaic covenant; does it replace the Abrahamic and the Davidic in the same way? Finally, whatever supersede means, it cannot mean that the promises of the earlier covenants fail to come to pass. Surely the promises of the Davidic covenant are still in effect. Circumcision, a rite signifying the covenant, is surely different from the promise of the land. The chapter closes with a summary of the significance of each of the biblical covenants. This is a good summary apart from disagreement on a few details. For instnace, the land promise is said to be a type. Again, how is a promise a type? Or, “we are no longer under the previous covenants in exactly the same way” as God’s people prior to Christ. This raises the obvious question: in what ways are we and aren’t we under covenants like the Noahic covenant? In chapter seventeen Wellum turns to the implications their proposal has for systematic theology. There is a great deal to appreciate in this chapter. I especially agree with his conclusions regarding the subjects of baptism. His approach to the issue of baptism was one that I came to in seminary, and Wellum has confirmed and strengthened my thinking on this matter. Another area in which Wellum provided enlightenment was his argument for particular atonement based on the intercession of Christ. This argument had previously seemed fairly weak to me, but Wellum’s presentation enabled me to feel its force. Nonetheless, I think there are several problems with it. Wellum’s argument is twofold: “(1) Christ’s work as our great high priest is a unified work; (2) Christ’s work as the mediator of the new covenant entails a particular and not a general representation” (672). The first point is really just another aspect of the debate over whether accomplished and applied are necessarily coextensive in scope or not. The second point, however, seems to be more significant. As Wellum unpacks this second point he argues that the priests in the Old Testament mediated only for the covenant people; Christ also mediates only for people in the new covenant. Since only the regenerated (and thus only the elect) are part of the new covenant, Christ only mediates (in both his cross-work and heavenly intercession) for the elect. On the face of it, this seems to be a strong argument. However, Wellum does not seem to reckon with the fact that the reason sacrifices were only made for those already in the old covenant was due to the genealogical principle. But, as he has argued forcefully in this volume, the new covenant does not operate on the geneological principle. Unlike the Israelites, who were in the Mosaic covenant before the Mosaic sacrifices were offered, no one was in the new covenant when Christ made his sacrifice. Since people enter the new covenant differently than the Mosaic covenant, the sacrifice cannot be made only for those in the covenant lest it be made for no one. Wellum does not seem to recognize this difficulty, for he grants that Christ intercedes for the elect both before and after they believe (674-76). He does not seem to recognize that this undermines the argument that Christ’s priestly work is only done for those in the New Covenant. He could respond that God knows who will be in the New Covenant, but intercession basd on foreknowledge is fundamentally different from intercession tied to who is in the covenant. If Wellum’s argument concerning baptism holds, as I think it does, then his argument regarding particular redemption does not. Wellum does anticipate and respond to some other potential objections. He notes that a proponent of general atonement could argue that the Old Testament priest represented only those in the Mosaic Covenant but that Christ, due to the incarnation, represented the whole human race (see Heb. 2:9). To this Wellum replies that Hebrews 2 is clear that Christ only mediates for and brings to glory Abraham’s seed. The second general atonement argument to which Wellum responds sees the typology of the Old Testament priestly ministry differently from Wellum. It notes that the Old Testament priests offered sacrifices for a mixed group of believers and unbelievers. What was true of the type is true of the antitype. Wellum has three responses. First, he reiterates that the Old Testament priests only represented those within their covenant. Second, the work of the Old Testament priests was typological and antitypes are always more particular than types. Third, the new covenant is more effective than the old covenant. I find Wellum’s first two counter-arguments to be weak. There is agreement about the first point; there is disagreement about its significance (see above). So reiterating the point doesn’t really establish the conclusion. The second point is an assertion that Wellum fails to establish. In fact, wouldn’t he say that the land promises become less particular, moving from a type which is a particular plot of real estate to an antitype which is the entire new creation? The third argument is stronger. In response, though, one could affirm that Christ’s sacrifice was more effective than Levitical sacrifices and still hold that he made sacrifice for both believers and unbelievers. Christ’s sacrifice is effective in that it saves those who believe whereas the blood of bullas and goats could never save. Wellum concludes the book by turning to eschatologym which brings him back to the issue of the land. First he reiterates his rejection of the unconditional/conditional categorization of the covenants, affirming both that disobedient Israel forfeited their right to the land and that Jesus will bring the land promise to fulfillment in the new creation. 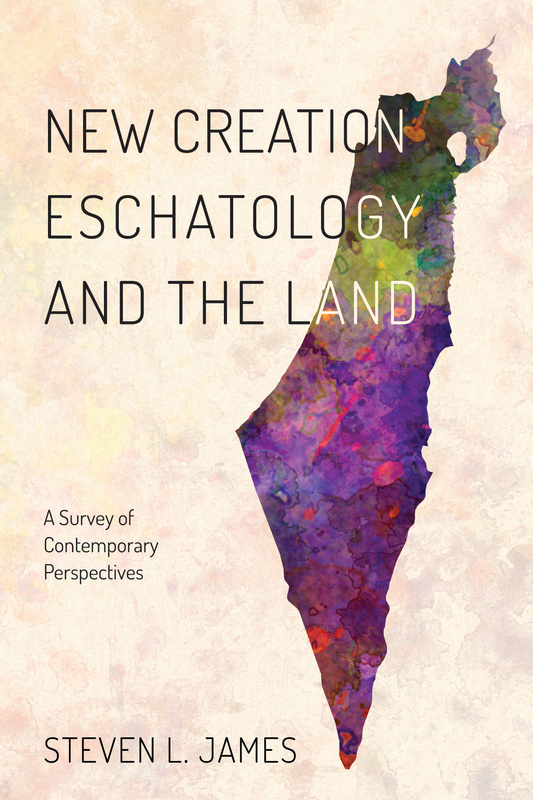 In particular, he argues that dispensationalists err in thinking that the land refers to “a specific piece of real estate with well-defined geographical boundaries” rather than recognizing that it is typological of the entire creation (706). Second, he says the Abrahamic covenant itself points to the typological nature of the land promise by promising universal blessings, which indicates that the promise cannot be tied to a particular territory. This is confirmed by the fact that the Bible does not give “consistent and precise” borders for the land (708). Third, when the Abrahamic covenant is understood in the context of the covenant of creation, then it becomes clear that land is a type of the new creation. Fourth, the fulfillments of the land promise by Joshua and Solomon are incomplete, and the prophets tie their land prophecies to the coming of the new creation, again indicating that the land is a type of the new creation. Fifth, Jesus fulfills all the covenants by bringing in the new creation. He thus fulfills the land promise in the new creation. I would agree with Wellum that the land promise points ahead to the new creation. In fact, I think I can make the case stronger by pointing out that the land, seed, blessing aspects of the Abrahamic promises connect to the blessing, seed, dominion promises in the Adamic covenant. Also, some of the land promise passages in Genesis point to a broadening of the land promise to the entire earth. For instance, Jacob is promised, “a nation and a company of nations shall come from you” (35:11) Land is likely implied in this promise. Gentry argues that goyim does not properly apply to the twelve tribes since they were not “politically and socially structured entities with government” (292-93). Nor does the divided kingdom of two nations constitute a “company of nations.” If Gentry is correct, it would be the universal blessing aspect of the promise to Abraham that would be picked up here. It would also be an early instance of implied extension of the land promise. As the Old Testament continues, the extension of the land promise is made more explicit (Psalm 72:8). But if the Old Testament can promise at the same time both particular land promises as well as point to the extension of the promise to the entire creation, why cannot the fulfillment inlcude both the particular and the general? The is no contradiction in Israel possessing a particular land in the new creation and the other nations all enjoying the restored new creation. The other arguments, such as the lack of “consistent and precise” borders are fairly weak. When the passages are examined, it seems that these inconsistencies are more imagined than actual. If this were an issue of inerrancy, I’m sure Wellum would have little trouble in harmonizing the passages. 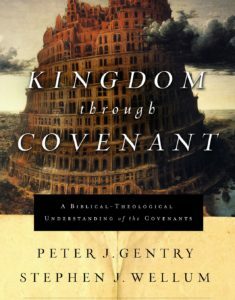 While this review has been largely critical, there is much to appreciate in Kingdom through Covenant. I think the title expresses in a pithy way one of the central themes of Scripture. The importance given to the biblical covenants, the defense of a creation covenant, the critique of covenant theology’s single covenant of grace under two administrations, and the defense of believer’s baptism on the basis of a proper understanding of the new covenant are all teachings with which I heartily agree. Despite the differences, I’m looking forward with anticipation to Wellum’s forthcoming contribution on Christology in the Foundations of Evangelical Theology series as well as to other writing that he and Gentry produce. He defines preaching thus: “Authentic proclamation is simply the declaration of the original Christian message of redemption and its immediate relevance to man and society. The hermeneutical problem of proceeding from the biblical words and sentences to their exposition in contemporary life must proceed in all confidence that in the scriptural revelation God has already proceeded once-for-all from his enduring truth to appropriate and proper words.” Throughout his distinguished career as a writer, Carl Henry sought, sometimes desperately, to reawaken pastors and church leaders to their responsibility to bring biblical exegesis to bear on contemporary problems and social ills. For him, kerygmatic preaching necessarily includes application to the crises of the hour. The gospel does not address individuals only— although it always must address them— but also communities, cities, nations, governments, and the principalities and powers of the age. 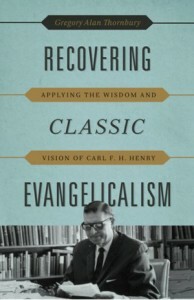 Gregory Alan Thornbury, Recovering Classic Evangelicalism: Applying the Wisdom and Vision of Carl F. H. Henry (Crossway, 2013), 150, citing GRA, 4:490. Bavinck argues that the renewal of a physical world is necessitated by the doctrine of redemption. “God’s honor consists precisely in the fact that he redeems and renews the same humanity, the same world, the same heaven, and the same earth that have been corrupted and polluted by sin” (717). To put it another way, “The scope of redemption is as great as that of the fall; it embraces creation as a whole” (Wolters, 72). The resurrection of the body also points toward a recreated earth. Christ returns to earth in a physical resurrected body and at that time brings about the physical resurrection of humans. Consistent with the resurrection of the body is the renewal of the physical world (Bavinck, 718; Ladd, 682; cf. Rom. 8:18-25). Bavinck, Herman. Reformed Dogmatics: Volume 4: Holy Spirit, Church, and New Creation. Edited by John Bolt. Translated by John Vriend. Grand Rapids: Baker, 2008. Ladd, George Eldon. A Theology of the New Testament. Revised ed. Edited by Donald A. Hagner. Grand Rapids: Eerdmans, 1993. Wolters, Albert M. Creation Regained. 2nd edition. Grand Rapids: Eerdmans, 2005. The foundation for the hope of a physical eternity rests in the Old Testament expectation of physical, earthly kingdom of the Messiah (Ladd, 681f.). Isaiah speaks of the Spirit-empowered Davidic Messiah righteously ruling over an earth in which both animal and human aggression are put to an end. (Isa. 11-12). Amos ties the rule of the Davidic Messiah to the abundant fruitfulness of the earth (Amos 9:11-15). Joel also emphasizes the abundance of the earth, and this he ties to Yahweh ruling from Zion (Joel 3:17-18). The Psalms anticipate Zion will be the location of future salvation (Psalm 2:6; 14:7; 53:6; 110:2). Isaiah envisions Zion as the location where Yahweh will rule the world in justice (Isa. 2:1-4; cf. Mic. 4:1-7; Jer. 31:1-12). He also connects a future Jerusalem with the New Heavens and New Earth (Isa. 65:17-19). Excursus on the Millennium: Many of the prophetic passages above have been taken by premillennialists as Millennial promises. Should they be taken as millennial, as referring to the eternal state, or as referring to both? Some passages like Zechariah 14 are clearly millennial since they include elements which cannot be the case in the eternal state. Interestingly, Isaiah 65-66 contains a mixture of elements some of which only fit the eternal state and others which only fit the Millennium. Prophetic books mix time periods in this manner. Other prophetic passages that refer to future blessing on earth centered on the Davidic Messiah ruling from Zion could well refer to both the Millennium and the New Heavens and Earth. The future hope of an earthly kingdom ruled by the Messiah remained the expectation of the disciples. Though Christ told them they could not know the time of the visible arrival of the kingdom, he did not deny their understanding of its nature (Acts 1:6-8; see Bavinck, 718f.). The epistles also speak of resurrected believer’s ruling with Christ (2 Tim 2:12; Rom 5:17; Rom 4:13; 1 Cor. 6:2-3; see Schriener, 856). Revelation 21:1 and 2 Peter 3:13 provide the most explicit revelation of a new heavens and new earth. Romans 8:18-25 teaches that the creation is awaiting redemption also. When our bodies are redeemed, the creation will itself be set free from its corruption. Less directly, we have the promise that the meek will inherit the earth (Matt. 5:5), that Abraham will be heir of the world (Rom. 4:13), and that humans will enjoy food and drink in the eternal state (Luke 22:16, 30) (Bavinck, 719; Schriener, 841-64). In sum, the Old Testament clearly anticipates the future worldwide rule of the Davidic Messiah. This hope remains in the New Testament. It begins to be fulfilled in the Millennial reign of Christ, but several passages indicate that this kingdom will extend into a new earth that will last for eternity. Schreiner, Thomas R. New Testament Theology. Grand Rapids: Baker, 2008. In his New Testament Theology, Donald Guthrie argues for “the absence of any materialistic conceptions of heaven” (879). Even though he acknowledges that 2 Peter 3:13 speaks of “a new heavens and earth,” Guthrie says, “This appears to be a material interpretation of the heavenly state, but it is probable that it was no more intended to be taken literally than Revelation 21:1” (884f., cf. 887). Guthrie is not clear about the motivation for interpreting the resurrection of the body in a material sense while at the same time denying that the eternal abode of these resurrected, embodied people is non-material. In his arguments for a non-material heaven, Guthrie seems to equate eternal life and heaven. But the passages he cites nowhere connect the two (881). Similarly, he states that in heaven humans will not be married (877), but the texts cited simply say that in the resurrection humans, similar to the angels in heaven, will not marry. The texts do not say humans will be resurrected to heaven. More favorable to Guthrie are Colossians 1:5 which says the Christian hope is “laid up . . . in heaven,” 1 Peter 1:4 which says the Christian inheritance is “in heaven” (cf. Luke 12:33), and Hebrews 11:16 which says Abraham and those like him seek a heavenly country. Nevertheless, these texts do not say heaven is the eternal destination of believers. The Christian hope and inheritance is currently in heaven, but this does not mean that it will stay there. Revelation pictures the New Jerusalem descending from heaven. Likewise, the country sought by Abraham is heavenly, but it is not necessarily in heaven. Hebrews indicates that Abraham did not receive what was promised (Heb. 11:13). Thus we should expect that someday Abraham will receive what God promised. Genesis 17:8 promised Abraham the land of his sojourning as an eternal possession. This raises the question of the re-creation of the earth. How can Abraham receive the land of his sojourning if God recreates the earth? Perhaps the best analogy is the resurrection body. Resurrection bodies are clearly different than the bodies Christians now have, and there is no indication that God is going to recreate these bodies using the same molecules. Nevertheless there is a clear continuity between the dead person and the resurrected person. John 14:1-6 also may seem to support the conception that God’s people will spend eternity in heaven. Jesus said that he was going away to his Father’s house to prepare rooms for his disciples. It is clear that the Father is in heaven (cf. Matt. 5:45). Jesus will then come again and take his disciples to be with him. This seems to indicate that Christ will return to bring his disciples to heaven. This passage must be harmonized, however, with other passages that teach believers will live on earth during the eternal state. It may well be that what Jesus refers to in John 14 is coming for his people at the rapture. According the the pre-tribulation model, saints will dwell with Christ in heaven during the tribulation. At the end of the tribulation they will return to earth with him for the Millennium and the eternal state. Guthrie, Donald. New Testament Theology. Downers Grove, IL: InterVarsity, 1981.